Anyway, the cruise destination is MEXICO. And because I want to solidify my mark as an International Author, I'm releasing the Spanish translation of my "How To Write Your First Book: Helping Aspiring Authors Overcome the Book-Writing Hurdle" book today. It’s been a few weeks since the overwhelm of my latest book release, Look Better In Writing: A Quick & Easy Guide to Capitalization (Vol.2). Now that I have a fresh mind to level-headedly reminisce about the pros and cons of my book signing on March 3, 2018, I thought it would be a great time to blog. 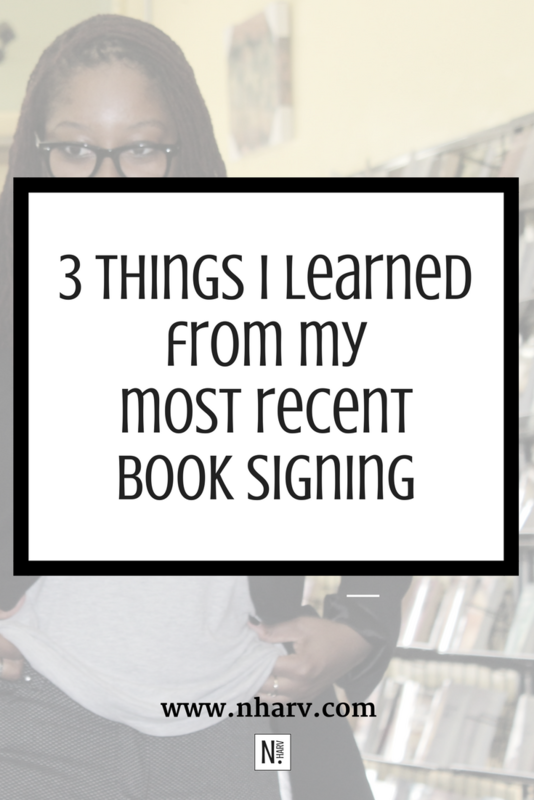 Okay, let’s move on to the three things I learned from my most recent book signing and how you can learn from them, too. Sometimes, people may be experiencing your book for the first time. Sometimes, your book’s cover does not fully describe what the book is about. Sometimes, people forget your book’s purpose. This is all okay, but as an author, you must be ready to explain what your book is about at any given moment. That being said, Look Better In Writing: A Quick & Easy Guide to Capitalization (Vol.2) is about the most common rules for writing or printing in capital letters. [The first volume of the Look Better In Writing (LBIW) book series is about punctuation marks.] Both books are written to help people strengthen their written communication skills and gain confidence in their writing. Like Vol.1, this book is condensed into a quick & easy guide. Meaning, I don't define every single capitalization rule in the history of English, because who has the time to read all of that?! Each book chapter represents a common capitalization mistake that I see on/in social media, professional emails, text messages, and anywhere else there’s writing. If you’ve ever gotten confused about capitalizing days of the week, seasons, and proper nouns, then Look Better In Writing: A Quick & Easy Guide to Capitalization (Vol.2) is for you! Ever drafted an email and got stuck on whether or not you should capitalize a word? Ever wanted to recommend a book online, but didn’t know how to capitalize the book title? If you’ve ever gotten confused about capitalizing days of the week, seasons, and proper nouns, then Look Better In Writing: A Quick & Easy Guide to Capitalization is for you. Don’t let a basic grammar rule like capitalization hold you back from writing an easy-to-understand text message, social media caption, blog post, college essay, professional email, business proposal, church announcement, or any other form of written communication. The meaning of a word can change by simply capitalizing one letter in that word. That’s pretty powerful! Learn how to hold the power in your hands by learning when, why, and how to capitalize in writing. The Black Panther movie is expected to generate about $200 million this weekend. Aside from the projected monetary success, the critically-acclaimed reviews will put this film in a category of its own. Black Panther is not just another superhero movie. It's a cultural milestone; a movement. Needless to say, I can't help but think about the possibility of this movie not happening. What if Ryan Coogler--the writer and director of Black Panther--would've quit halfway? Then we wouldn't have had the privilege of experiencing this moment in history. A moment that has unified a group of people with something (seemingly) as simple as attire. What if Coogler would've said it was too much or deemed the production unworthy? Then we wouldn't have had this example of a success story. The success story of a rising director and screenwriter in a well-established town called Hollywood. Three years ago today, I published my first (and only) short story. Like Dr. Martin Luther King Jr. (MLK), I, too, had a dream. As a child, I dreamt of becoming a famous author among other things. I didn't think it was possible, so I pushed that dream aside and pursued careers that had more clearly-outlined paths like teaching. Nevertheless, January 15, 2015, was the day one of my dreams became a reality. My short story Confessions of an Adult Nerd: The Bay Area Blues (Volume 1) hit Amazon and was well received. My first book, SoKoDiaries: An American Teacher Living in South Korea, was a biography of sorts, where I revealed my excursions as an English teacher living in a foreign country. While living and teaching overseas in South Korea (SoKo), I had tons to write about because I was experiencing something that was new to me and my audience at the time. In fact, this is what my audience was used to reading from me: true stories about my life as an educator. But after the third and final volume of SokoDiaries--my first book series about my teaching in South Korea--I wanted to try something different. I wanted to try my hand at short stories. My childhood dreams and vivid imagination came rushing to me near the end of 2014, and I needed a creative outlet. I wasn't confident in my ability to pull off another book genre other than non-fiction, but I tried it anyway. In honor of MLK, I made my dream a reality by clicking "publish" on Amazon three years ago. Confessions of an Adult Nerd: The Bay Area Blues (Volume 1) is MY testimony. I thank you guys for celebrating my bookiversary with me, but what about YOUR testimony. I know writing a book is challenging, but perhaps I can give a few simple strategies you can use to make the book-writing process more digestible. 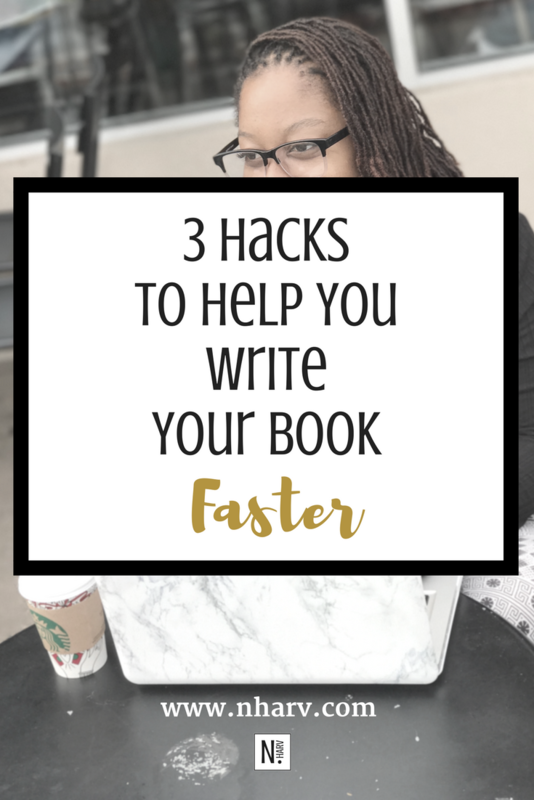 This blog post consists of three hacks to help you write your book faster. I understand that there are different types of writers. Some writers are decision makers, so it doesn't take them long to create chapter titles, book covers, etc. because they're sold on their decisions right away. But that's not everyone's testimony. In fact, I know of a few writers who like to let their work sit for a while, and they come back to it days and weeks (and maybe even years) later to make sure it's what they really want to share. Whatever type of writer you are, I believe these three writing hacks will help you write your book in less time than you think is necessary. 1 || Put your book in a 3-ring binder so you know it’s real. This may sound cheesy and pretentious all at the same time, but it works. Sometimes, we get so tied to our computers/laptops that we cannot see our writing progress or lack thereof. If you print out your book and see blank chapters, then it'll hopefully inspire you to create chapter titles along with the content that is appropriate for each chapter. Or you may find that you actually need to edit a few chapters and scale down. Or you may find that your book is not that far from being publish-worthy. The physical, printed papers help with the book-writing process because your work will feel more like a book, and it will be organized in case you want family and friends to proofread it. First of all, Happy Thanksgiving! Second of all, it's almost the bookiversary (book + anniversary) of my first grammar book, Look Better In Writing: A Quick & Easy Guide to Punctuation Marks (LBIW). This time last year, I was writing and adding the finishing touches to the LBIW book. I released it on Black Friday in 2016. So, tomorrow, I'll be celebrating my bookiversary. In the past 364 days, my LBIW book has made its way to seven different college and university libraries. WOW! In any case, I wanted to celebrate tomorrow by offering my LBIW book for $3.00. Say hello to Black Friday and Cyber Monday! I'm excited because today is not just the first of any month, but it's the first of November...THEE month for writers! For those who are not familiar, November is "National Novel Writing Month," also known as "NaNoWriMo." This is the month that a lot of writers were/are born. 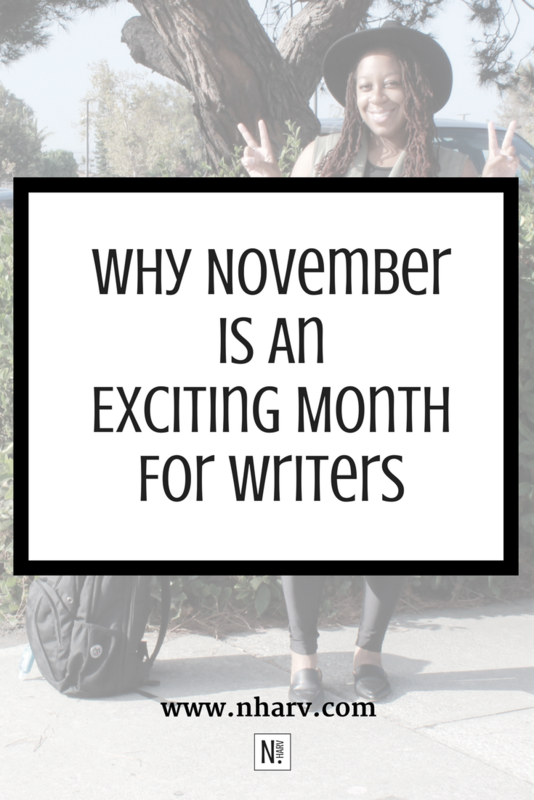 This is the month filled with tons of online writing encouragement and advice from other writers, novelists, etc. This is the month that I got serious about writing my first book, SoKoDiaries: An American Teacher Living in South Korea. (Although I didn't publish my first book until February 2013, it was mostly written in November 2012 while I was overseas in South Korea.) So much literary magic has happened since then! Nine times out of ten, we--humans--do not get around to accomplishing our goals if there is no urgency or deadline attached to it. Well, the same applies to any book-writing goal. NO DEADLINE, NO BOOK. At least not as soon as you would like to have it written. Deadlines help you reach your goals. Setting a deadline is an actionable step. Another benefit of a deadline is that it can be broken down into mini deadlines. For instance, if you desire to write a seven-chapter book in two months, then you can break down that deadline by writing one chapter per week. That’s reasonable. With this process, you will reach your deadline in about seven weeks. If you decide to have your book edited (which you should), you have a week of wiggle room, or you can set another deadline for the editing process. See how we just set a goal AND deadline for a seven-chapter book and it doesn't seem overwhelming?! That's the power of setting deadlines. Keep in mind that deadlines are different for everyone. They may depend on budget, access to resources, skill set, and expertise, and personal circumstances.